With a booming real estate market and an ever-increasing general appreciation for good design, more and more architects are betting their own hard-earned cash that their skills will pay off in the development business. Deborah Grossberg asks New York architects how and why they made the leap to the other side. For much of the AIA’s 150-year history, the organization prohibited architects from engaging in development work. Intent on distinguishing architecture as a noble professionn on the level of fine art, distinct from baser building trades like carpentry and masonryythe AIA also felt the need to protect its members from the economic ruin met by early architect-developers, like Robert Adam in London and Charles Bulfinch in Boston. It was not until 1964 (by then, the profession was well established and the success of architect-developers like John Portman of Atlanta celebrated) that the AIA relaxed its ban on working in property development. It even issued a document in 1971 encouraging architects to pursue it. But the practice still carries some stigma, harkening to the AIA founders’ fears that the crassness of the business would compromise the conduct of the gentleman-architect. Architects have always done development, but high design firms haven’t,, said Gregg Pasquarelli of SHoP Architects, a firm that’s been involved on the development side of its projects since building the Porter House at 366 West 15th Street in Manhattan’s Meatpacking District in 2003. But all that’s changing now.. The simplest reason why better firms are getting involved in development is the skyrocketing real estate market. Peter Moore, an architect who’s been developing his own projects with his firm Peter Moore Associates since the 1980s, said, Because real estate has become so lucrative in the last dozen years, it’s attracting more and more people, including good architects.. Another factor is the public’s increased sensitivity to design since 9/11. There’s more of a recognition now that architecture can create value,, said Jared Della Valle, principal of Brooklyn-based firm Della Valle + Bernheimer, which has been involved with an affordable housing development project in Brooklyn for the past three years. In other words, developers are beginning to see architects on more equal footing, as valuable creative partners who can help them conceptualize a projecttand make it more profitableefrom the outset. Pasquarelli, who is trained as an architect and holds an undergraduate business degree, agrees that the perception of what designers can bring to the table has improved. We’re not just selling a building wrapper, but solving real design problems,, he said. There’s been a big shift in the value and vision that architects bring to a project, and we’re finally being remunerated in equity, partnership, and property..
For a ground-up construction at 258 East 7th Street between Avenues C and D, Derek Sanders designed a building partly on spec and partly for a clientta couple willing to front the money for the 10,000-square-foot triplex penthouse. The couple’s investment helped offset the cost of the rest of the project, which includes seven additional units, mostly two-bedrooms. It is slated for completion in late summer 2006. It may be a prime time to dive in, but getting started in the development game still has a fair share of challenges. For one thing, the financial interests of developers and architects are often at odds, so doing both can at times feel schizophrenic. Working as both developer and architect, in a way you’re negotiating against yourself on fees,, said Della Valle. Since architects’ fees are paid at the beginning of a project, you’re paying interest on any dollar you get for fees as part of your loan. Architects’ fees are one of the things that developers are always trying to reduce.. Besides pouring their own man hours into their project, Della Valle and co-principal Andrew Bernheimer also asked three other firmssArchitecture Research Office, BriggsKnowles, and Lewis.Tsurumaki.Lewissto collaborate on designs in an effort to give each unit in their affordable housing development a unique identity. Aside from conflicting interests, the hardest part for most architects is scraping together the cash for that first down payment on property and construction loans. Small practices often have trouble convincing banks that they’re right for a mortgage, and many don’t want to risk their entire livelihood even if financing is attainable. The most common solution is to partner with a developer or investors, but on a more equal basis than in a standard for-fee project. Many architects who develop their own projects swear by starting small. Pasquarelli worked with developer Jeffrey M. Brown on the Porter House project, investing a small fraction of the total cost but a much larger percentage of his firm’s net worth. It was really, really frightening,, he said. The risk paid offfone bedroom flats sold for more than $700,000 and the four-bedroom duplex penthouse went to fashion mogul Carlos Miele for over $4 million. Now Pasquarelli is using the profits from the project to finance four collaborative development projects in New York, Los Angeles, and Philadelphia. Derek Sanders, a 44-year-old architect and principal of CAN Resources who recently began investing in his own projects with the help of a young developer, Seth Tapper, said, With our first project, we started out with a much smaller percentage of the equity. We waived our fees entirely and contributed a little capital. The first project made money, which we rolled into the second one.. According to Sanders, the approach has paid off. Architects don’t usually get paid very well anyway,, he reasoned. As long as you have low overhead, you can make multiples of your regular fees [by trading them for shares]..
AvroKO invested about 50 percent of the capital for the development of twin one-bedroom co-op apartments at 23 Waverly Street in Greenwich Village. The firm outfitted each unit with everything you could get excited about,, according to principal Kristina O’Neal, such as bacteria-killing lights, a Murphy bed with an astronaut foam mattress, and energy-efficient appliances. 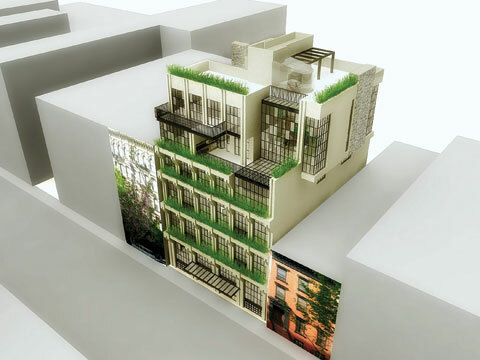 Architect Galia Solomonoff went even further with the bartering idea for a six-story residential building she’s working on in the East Village: She and the couple who owns the lot (they bought it for peanuts in the 1980s) took no loans at all, and convinced all the contractors involvedd Solomonoff includeddto waive part of their fees in exchange for equity. The traditional wisdom of business people is to borrow as much as you can, put your building up as quickly as possible, and flip it before you pay too much interest,, said Solomonoff. The wisdom of artists is don’t borrow and don’t rush..
Sanders has made his equation work partly by picking a co-developer who’s relatively new to the game. Not having done a lot of development already, Seth is open to new ideas,, he said. He’s also used some creative methods to offset up-front costs. With the help of real estate broker Larry Carty, Sanders and Tapper managed to find a Japanese couple to pre-purchase the penthouse apartment in a ground-up construction they’re working on at 258 East 7th Street. Sanders is designing the top three floors according to the couple’s specifications, but the rest of the building is up to him. Because residential work relies so much on the sanity of your clients, I’m of the opinion that the more you can be your own client, the better,, said Sanders. The young design firm AvroKO also got into development to shed the burden of designing for clients. For us, the core reason to do self-propelled projects is to be able to do something you can’t do with conservative clientssto go with the ideas you want,, said Kristina O’Neal, one of AvroKO’s four principals. The group owns and operates the restaurant Public, which opened in Nolita in 2004. 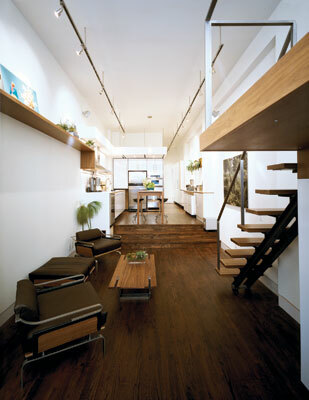 This year, they designed two fully-outfitted one-bedroom apartments in Greenwich Village under the moniker smart.space. They are marketing the units themselves, and at press time there was a bid on the less expensive, smaller of the two units (the asking price for the 590-square-foot unit is $649,000, and $753,250 for the 655-square-foot space). Investors fronted part of the cash for both projects, though AvroKO owns significant stakes in both. But according to O’Neal, they’re not in it for the money. It’s been somewhat profitable,, she allowed, but we’re mainly supporting ourselves through fee- based work.. The firm is currently planning more smart.space units, to be completed in 2006, as well as another internally-developed project to be released in the fall. We learned a lot from these projects,, said O’Neal. The next ones will be easier and more affordable..
Peter Moore, an architect who began developing affordable housing projects in the 1980s in Brooklyn, is currently involved with five development projects in Manhattan. 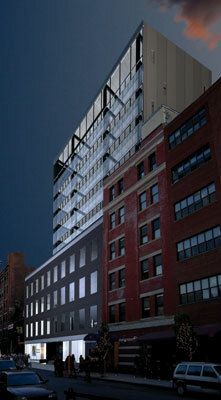 For a project at 520 West 27th Street in Chelsea, Moore partnered with Flank Architects to develop a new 11-story, 50,000-square-foot mixed-use condominium building currently under construction on the site of an old four-story warehouse and showroom for American Hanger and Fixture. Developing projects offers as many constraints as freedoms, but many architects have found the new limits compelling. It was fantastic because we only had to answer to ourselves,, said Pasquarelli. We had to ask, Do we really think that extra stainless steel detail is worth it?’ And if the answer was yes, then we had to pay for it!! Bernheimer agreed, You have to make decisions informed by economics but there’s always the opposite challenge to do something unexpected within the constraints.. The first development project is always the hardest for architects unaccustomed to working in real estate. From an architect’s standpoint, the most daunting part of our development project has been the time commitment,, said Bernheimer. The learning curve has been so steep that, of the three years we’ve spent on the project, a good year was spent learning the ins and outs of the real estate market.. The educational experience can be a plus, though. Solomonoff said, I really enjoy that the team of experts you work with becomes larger. In a project where you have a developer interest there’s a real estate person with a different outlook on the architecture and design market, as well as lawyers who have a more conservative point of view about the value of design. It enriches your role as an architect..
Bernheimer and Della Valle brought in partners with more development experience to help them sort out the rigmarole of purchasing land from the city for affordable housing. The firm felt that city RFP requirements, which demand finished designs before a bid is won, tended to force affordable housing developers into cheaping out on architecture services. Developers usually just submit something that’s already been done to avoid spending money on architects’ fees,, said Della Valle. But for most of the people [for whom affordable housing is created], it will be their first home purchase. 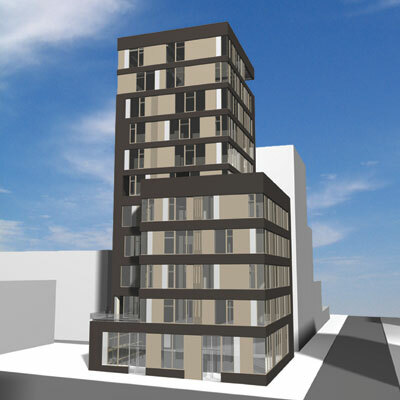 That requires more thought about design rather than less..
Moore is working on another 11-story condo project, at 302 Spring Street in the West Village, with Zakrzewski & Hyde Architects. Principals Stas Zakrzewski and Marianne Hyde (who are married with two children) earned a three-bedroom stake in the new project in exchange for waiving design fees. Their design incorporates a small communal courtyard as well as a stainless-steel shutter system which allows residents to control the flow of light and air without losing privacy. Moore agreed that the city could do more to encourage good architecture along with development. City Planning and the Landmarks Preservation Commission make feeble attempts, but they’re not doing enough,, he said. They should encourage a more fully integrated approach to harness the boom.. Since the city hasn’t managed to keep developers in check, Moore thinks the biggest strength architects can bring to development is a sense of responsibility for the built environment. It’s encouraging to have architects develop because they bring integrity to the process. If you’re looking to maximize your value, it’s not necessarily a strength to be an architect, but building buildings isn’t an abstract thing like selling bonds,, said Moore. Most architects involved with development are continuing with their regular practice as well. Said Sanders, You have to balance how much risk you want to take on.. Perhaps the most compelling reason for architects to get a taste for what it’s like to be a developer is to encourage better understanding across the divide. I’m interested in having the most participatory role possible as an architect,, said Solomonoff. There’s both more freedom and more responsibility..